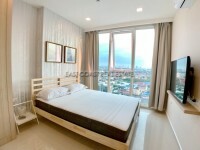 1 Bedroom Sea Views - South Side for SALE or RENT at The Base Pattaya Condominium. This unit is set on the 29th floor and has a balcony facing to the sea and Pattaya City Views. It has fully furnished and comes with kitchen, living space with flat screen TV and sofa. Queen sized bedroom with fitted wardrobes, bathroom & hot water shower. Ceramic flooring and air-conditioning throughout. Balcony. Washing machine. This project is located in the best location. Positioned along Pattaya Second Road in between South & Central Pattaya this downtown residence means that everything is easily accessible. The Base Pattaya Condominium provides excellent facilities such as 24hr security, key card access, 2 communal swimming pools, sea view fitness center & sauna, games room, playground and even a library, covered parking space. For SALE under Thai quota with 50/50 transfer & tax fees, also for RENT long term with FREE internet & AIS TV in room.